A woman undergoes a major surgery to change her appearance, after which she loses her memory and becomes a totally different person. Her doctor helps her bring back her lost memory and in the process, falls in love with her. The new mystery romance thriller "Let Me Introduce Her," set to begin this weekend on SBS, follows the journey of a confused woman seeking to find out her past and discover her true self. Actress Nam Sang-mi, who plays protagonist Ji Eun-han, said Friday she was "absolutely attracted to the character" when she read the script, and the viewers would know why she chose the drama only near the end of the show. "I can't talk about it now, but audiences will see why I've chosen it when they see a certain scene and the outpouring of emotions," she said at a press promotional event at the network's headquarters on Friday. She added that the very scene is what every actor dreams of performing some time in their career. While the drama is basically a thriller, she said it is also a "warm" story that can be viewed by families on weekends. "There are many dramatic, interesting factors in the series, allowing me to perform various acting scenes. It also delivers a warm and powerful story," Nam said. Actor Kim Jae-won, who plays plastic surgeon Han Kang-woo, said his character is refreshing for him after playing villains in a series of recent works. "Performing bad characters in a row has been hard, to a point where I've fallen sick. This character is similar to my real self so I thought to myself that it would save me," Kim said. Actor Jo Hyun-jae, who plays news presenter Kang Chan-ki, especially spared his words as the character, according to him, holds an important key to solve the mystery surrounding Ji Eun-han. "It is a story about a woman who lost both her appearance and inner side setting off a journey to find herself. 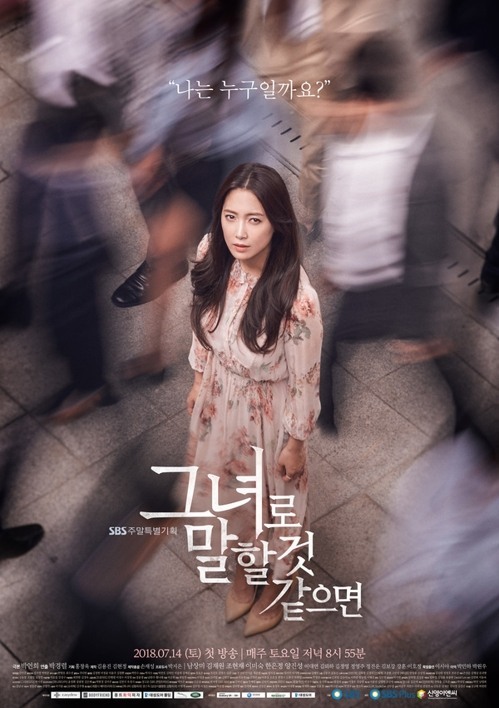 It is full of interesting twists, although we can't tell you much now because of possible spoilers," producer Park Kyung-ryul said. "Please watch the show to find out more." The drama will face off with tough competitors, including cable channel tvN's "Mr. Sunshine," which garnered an average rating of 9.3 percent for the first two episodes aired on last Friday and Saturday. "I watched (Mr. Sunshine) and it was very interesting ... But viewers will get easily hooked on our show and find it hard to stop watching it," Kim said.